The New Food Collective is a community of farmers, butchers, and eaters who champion real and delicious food. This means raising animals outside, on pasture, to improve the quality of the meat and the land, too. In other words, the way animals were meant to be raised. We accept no compromises as we forge a new, better food system. Join us. Our producers are committed to raising animals outside. Why? For one, it’s the right thing to do. But outdoor grazing is also a key part of regenerative farming practices, which build healthy soil and improve water retention and biodiversity on the land. Learn more about regenerative farming and how the New Food Collective supports it here. We make food we want to eat. It starts with pork from happy pastured pigs that roam the woods and fields, producing meat that is juicy and richly flavorful. Then, we turn it into souped-up versions of classic sausages, plus new alluring flavors that are destined to be classics of their own. All our products are rated Step 4 by the Global Animal Partnership and certified by the American Grassfed Association (pdf). We craved the ideal all-day breakfast. It took a few batches. But we nailed it with this of sweet, salt, heat and pork. Who says you can’t improve on a classic? Our juicy pork is delicately laced with sweet fennel seed, sea salt and pepper so it plays nice with everything. A fiendish combination of cayenne, chili flakes, garlic and fennel seed that will make this your go-to for soups, pasta and, of course, your Sunday sauce. 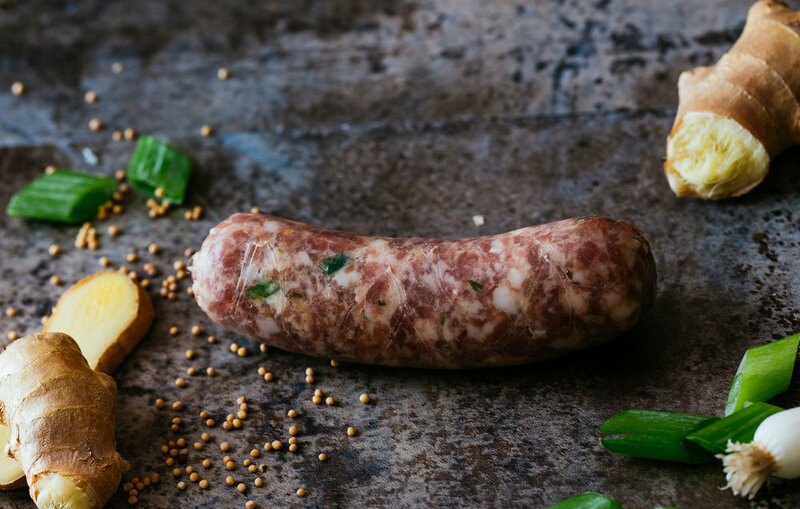 With zesty ginger, green onions and a hint of brown sugar, this sausage doesn’t need much more than a bun. But trust us: It’s also a star in everything from dumplings, lettuce wraps and curries.